Kathy, such a pretty card! Love the colors and thanks for the link to making starburst cards. Trudi, how cute!!! love the shrinky plastic sunflowers. Adorable card with all the details. Thanks so much for doing my challenge! Trudi, your card is fascinating! Bet it is even more so up close. Lots of texture and depth... plus the fun fold. Great job! This wasn't even close to what I had first designed. I distressed some printed DP and then splattered pink paint on it, then I cut out a "distressed" frame from my Silhouette along with the chevron border and at first I had a cut out Sun but it just didn't look right so I removed the sun, colored a 'sun flower' with my Copic markers (for more practice) and placed that on it. I still don't have a saying for it but maybe I will add something on the inside? Barry, not sure what image you had in your head... but don't know how it could beat the final product. Such a fun card! Love the sunflower. BTW- Is that a Printworks or Denami Stamp? Kinda looks like their style. MrsAsperin-Kathy wrote: Barry, not sure what image you had in your head... but don't know how it could beat the final product. Such a fun card! Love the sunflower. BTW- Is that a Printworks or Denami Stamp? Kinda looks like their style. Thank you, nope it is a sketch design from Silhouette America, from a long time ago when you had to purchase a cd of designs. Barry - great card...you don't need to add a sentiment on the outside. I'm not sure but I think I might have just created a new species of sun flower. You don't have to count me Jane. Man, I'm a rule breaker!! Barry, Gorgeous card!!! 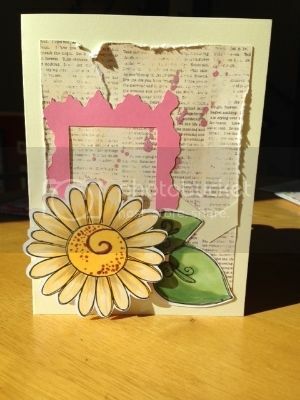 Love the vintage look and the sunflower is beautiful!!! Laura, of course it counts!!! That is an adorable Sunflower and I love the paper too. Thanks to both of you for doing my challenge!!! Barry, your card hits one out of the park. I love the design-very cool!! Laura, that's very pretty. I like that paper. Did you buy that on our trip? Laura, your card has such a fun, asymmetrical look. As for the sunflower hybrid... it is delightful!